it was rather by accident that I stumbled into UK cosmetic brand MUA (Make Up Academy) in December when searching for something completely different. Their stuff looked sure interesting and there just happened to be their 40% sale on their website because they just got their 40.000th Facebook like. I took the chance and ordered 4 palettes. Pretty Pastels, Undressed, Dusk til Dawn and Immaculate collection (not pictured YET because it is a huge one and I only have two arms). 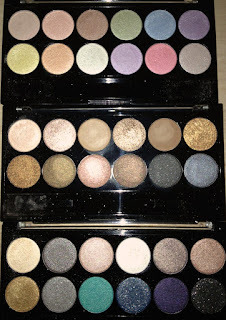 One of my beauty resolutions for 2013 is not to buy single eye shadows (unless they are really, really special) and more palettes cause in the long run they take up less space and it is easier to find a palette than the very single eye shadow that is somewhere in the huuuuuuge hill of eyeshadows. You know, the needle in the hay. Without further ado.... From top to bottom: Pretty Pastells, Undressed and Dusk til Dawn. Swatches are made without a primer. 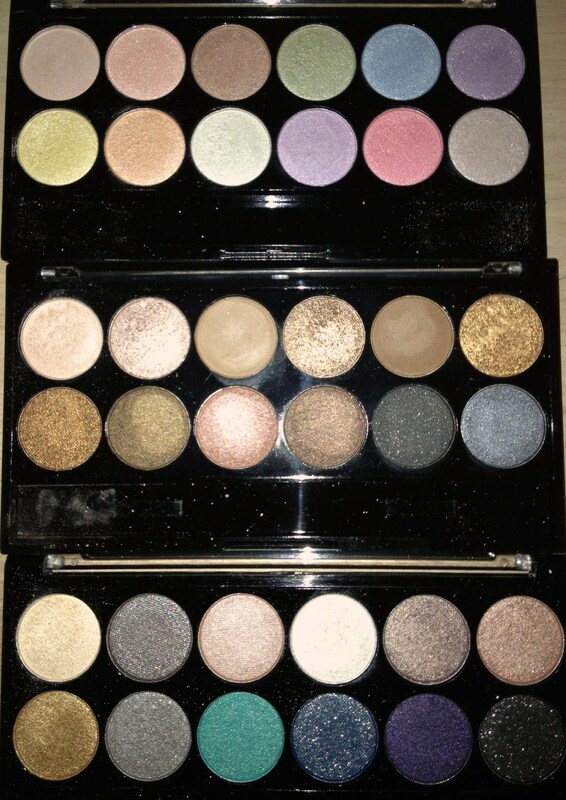 I am very happy with the palettes, only the few matte eye shadows sorta disappoint. If you take a look at the Undressed Swatches (second picture on the right side) they are no. 3 and 5 on top. Than again I rarely use matte eye shadows anyway and it doesn´t bother me really. Still grrrrreat value for the money (including the sale I maybe paid like 3 € per palette) so if you like shimmer shadows I TOTALLY recommend them. They are even prettier in real life, believe me. Dusk til Dawn (3rd photo on the right) has those super amazing colors (the three last one on bottom) which are soooooo sparkly . My mobile phone snapshot can´t entirely catch their beauty. Just believe me.